One of the most vital aspects of cannabis use is practicing proper storage habits. After visiting your favorite Des Moines dispensary, you want to be sure that your high-quality bud retains its aroma and potency. Storing cannabis improperly can lead to mold or mildew, which can completely ruin your precious batch of bud. While cannabis doesn’t expire, properly storing cannabis products to maintain freshness is well worth the extra effort or expense. Here are a few tips that can go a long way toward maintaining the quality of your cannabis for as long as possible. Keeping flower fresh ensures that you’ll get the most mileage out of their purchase. Often, poor storage practices can lead to cannabis that is dry or has otherwise lost its sheen, an indication that the cannabinoids essential to producing psychoactive effects have evaporated. When you first purchase your bud, you’ll notice that it’s covered in sticky little hair-like crystals called trichomes. These trichomes are home to those lovely cannabinoids, THC and CBD. Trichomes possess many of the qualities that give cannabis its reputation as both a recreational libation and a medicinal herb, meaning it’s vital to protect them in order to maintain the quality of your herb. Ideally, cannabis should be stored in a dark location below room temperature, like a cupboard, drawer, or closet. The presence of UV rays within light can break down trichomes over long periods of time and should be avoided for ideal storage conditions. Likewise, the amount of air stored with your cannabis can be a key metric to get right. Sealing your cannabis with too little oxygen can make for dry flower, while too much oxygen can contribute to degraded quality. While electric air pumps can be used to precisely measure air content, simply taking care to let a modest amount of air in your container or bag can go a long way towards preserving freshness. As cannabis often produces a strong, pungent smell, the container in which you store it can be important in protecting items adjacent to your stash. Many containers available for sale online offer airtight storage that does not exude marijuana odors. While purchasing an expensive, premium-quality container can be a good investment for the regular cannabis user, a simple tightly sealed glass jar can be just as efficient in conserving the freshness of your bud. Overall, it isn’t a difficult task to maintain ideal cannabis storage. With a small amount of knowledge, the consistency and potency of your cannabis can reach its full potential and completely change the tone of your next smoking session. Looking for a top shelf recreational dispensary with a wide variety of cannabis products? 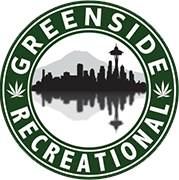 Greenside Rec is one of the nation’s premiere cannabis dispensaries, with an extensive menu featuring pre-rolls, concentrates, flower, edibles and much more. View our Des Moines online dispensary menu to check out all the goodies we have in store for you!